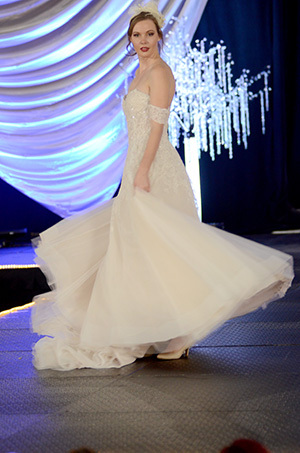 The Bridal Bazaar took place at the Convention Center Downtown on Jan. 13 to a crowd of perspective brides and grooms. Exhibitors set up for the convenience of one-stop shopping for that special day. Every aspect of their wedding could be found from music, photography, catering with yummy food samplings, honeymoon destinations, and of course, bridal gowns and tuxedos for sale and for rent. There were fun photo booths, fabulous giveaways, and many of the vendors had a spin the wheel for prizes. There were three fashion shows packed with attendees during the event. 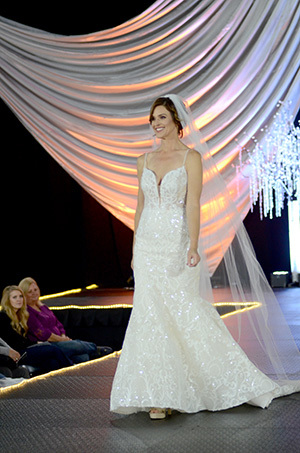 The theme for the runway was “Everlasting Love.” Gretchen Productions presented entertaining shows that incorporated dance, singing, and fashion with all the latest bridal trends. Each unique show began with music from Classic Brass. Patricia Norvell created the hair and makeup for all the models. 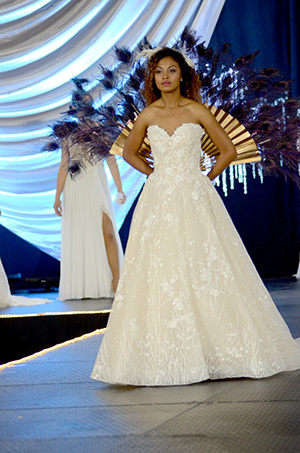 Some of the trends on the runway revealed stunning lace gowns with spaghetti straps. Many were heavily embellished with sequins and beads that sparkled and shimmered. Several models showed off strapless mermaid dresses. 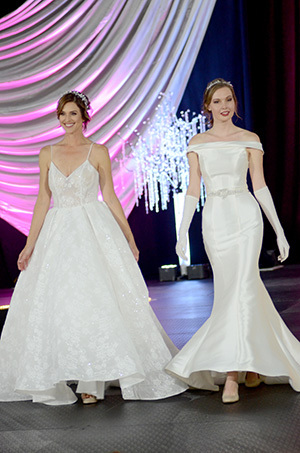 Princess dresses seem to be a style that is always a favorite for brides. There were a variety of necklines such as low V-necks, strapless, and bateau necklines revealing the shoulders. One of my favorite fashion was the criss-cross necklines. A variety of sleeves styles were shown such as cap sleeves and long sleeves. Some gowns had side straps and others had one-shoulder sleeves for a different look. The top-pick colors for bridesmaids were shades of burgundy, blue, and lilac. Many dresses had slits revealing their leg. One bridesmaid’s dress even had a floral design with the trendy slit. A few of the gowns had long trains and many of the models wore glamorous gloves. The runway showed styles for men from the Friar Tux Shop and the Men’s Wearhouse. The tuxes were slim fit, two button and notch lapel suits. The Friar Tux Shop revealed a variety of colors such as asphalt, heather grey and charcoal. The Friar Tux Shop has a new performance fabric from its Michael Kors Collection, which has stretch and Coolmax fabric for a more comfortable wear. It also had expert stylists available to help solve your style dilemmas. Zeglio Custom Clothiers was on hand for those who were interested in a custom suit. 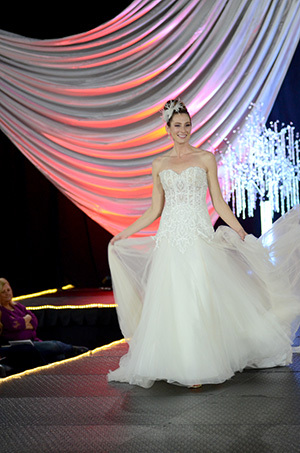 Feb. 9 – Winter Bridal Show from 10 a.m.-2 p.m. at the Westin San Diego. Free gifts for all attendees. 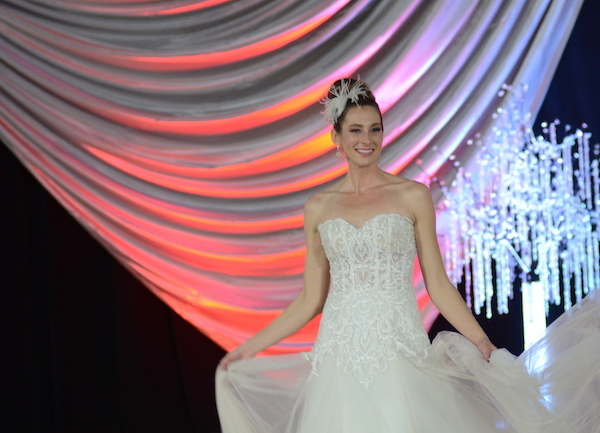 For tickets, visit thesandiegobridalshow.com. Feb. 26 – Wiggles & Waggles presenting Zandra Rhodes Fashion Show at the Del Mar Country Club. Event benefits the Rancho Coastal Humane Society. To purchase tickets, visit sdpets.org.